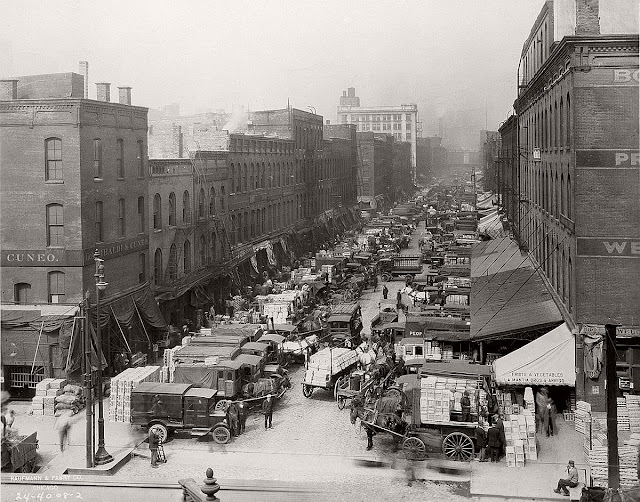 August 29, 1925 – After 80 years the South Water street market dies at noon as progress moves forward and the first link of the new Wacker Drive, between Franklin and Market Streets prepares to open to traffic the following day. This is the day on which wreckers start demolishing buildings on the north side of South Water Street east of La Salle to begin the eastern extension of Wacker Drive. With this action a market that began on the oldest street in the city, on a street where the first Board of Trade was established in 1848, with annual business of over $300,000,000, closes down and moves to a new location bounded by Fourteenth Place, South Morgan Street, South Racine Avenue, and the Baltimore and Ohio terminal. This market closed in 2001.